From the place I stay, there are two routes to reach a much frequented destination. As is expected, the faster route is chosen. The other day, on Google Maps, for some reason, both routes showed the same estimated time. I still chose the so-called faster route. I believe most people would do that. Most Mumbaikars – as Mumbai residents are called – do the same thing when they are travelling by local trains. If the slow train is in front and the fast train is expected much later, they wait for the fast train even if both trains are expected to take the same time, or even if, the slow one is reaching earlier. In their mind, people disregard the train waiting time and get a kick out of seeing the fast train breeze past the stations where it won’t make a halt. We let our minds trick us into feeling good! This got me thinking about the journey of high-potentials that organisations take such pains to organise and implement. Could there be a similar trick at play?! Take a look at the charting of the routes in the picture below. The standard route is what the ordinary employee uses. This is the route that best represents the chaotic and complex realities of life – obstacles, compulsory stops, no real-time, strategic oversight of proceedings as the expectations are adjusted to feel that this is business as usual or average. This route is on paper shorter as represents the earliest route taken to reach the destination – a once pioneering pathway that became a victim of its success. The faster route is the route of the high-potential performer. This is the route that represents the orderly manufacturing of a simulated reality. The route appears longer as the chosen ones are made to go through a few hoops as a part of their developmental plan. These hoops are however controlled conditions created so that the high-potentials efforts can be isolated for tracking, assessment and evaluation. Special projects are like one-way traffic routes and even here, there are people at hand to smoothen your path in case the controllable variables do not run as per the plan. When we evaluate the routes as a commuter, we do say that the faster route, even it is longer is better – especially for the vehicle – lesser wear and tear, mileage etc. The vehicle is the performance planning process. Not just the vehicle. Any driver ( whether high-potentials or not) will prefer this route for comfort and predictability. And that brings us to the key question! 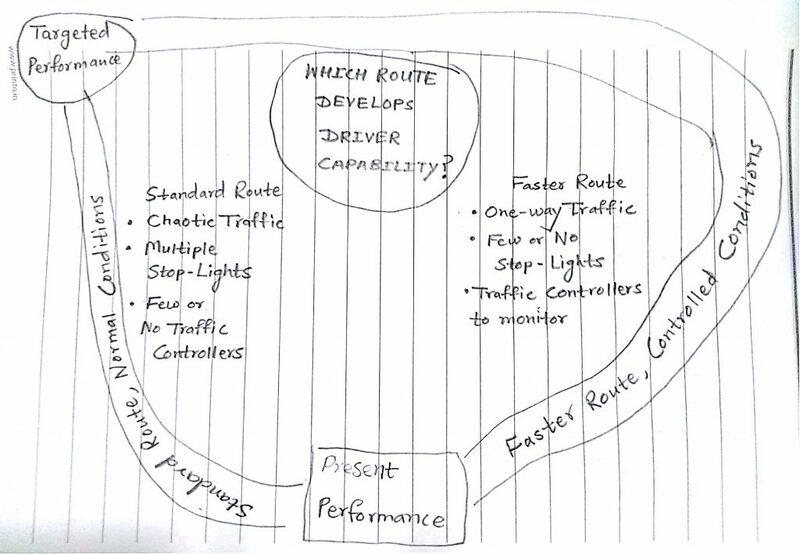 Which route best develops driver capability for the real world? Looking this way at the high-potential journey is simply turning the spotlight inwards on the subtle implications of what we choose to do. Just as we can choose to zoom in on one part of the photograph and let the other parts be blurred out for the moment, we can choose to ask – Are we letting our minds trick us into feeling good by conceptualising a complete script for best performance and executing it to perfection?! ← LeaderPlay – Turn your doubts into certainties and vice versa.